Entertaining thriller that serves up an unusual but effective blend of cheese and violence, heightened by an amusingly growly performance from Tom Cruise and some enjoyable action sequences, though there are some unintentionally laughable moments too. 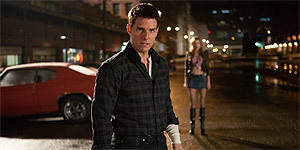 Written and directed by The Usual Suspects screenwriter Christopher McQuarrie, Jack Reacher is based on the novels by Lee Child and stars Tom Cruise (not quite the six foot five blue-eyed blonde of the novels, but let's move on) as ex-military drifter-slash-investigator Jack Reacher, one of those mysterious types who's always there when you need them, like a one-man A-team. When lone gun nut James Mark Barr (Joseph Sikora) is accused of killing five innocent people in a sniper attack, he asks his lawyer, Helen Rodin (Rosamund Pike), to get hold of Reacher, despite the fact that Reacher operates ‘off the grid’ and doesn't even own a change of clothes, let alone a cellphone. Being a man of mystery, Reacher shows up anyway and begins to suspect Barr has been framed, despite the fact that both Detective Emerson (David Oyelowo) and Helen's DA father (Richard Jenkins) think the case is open-and-shut. However, Reacher's investigations soon bring him up against vicious, fingerless Russian criminal The Zec (Werner Herzog) and his sadistic henchman (Jai Courtney). Appearance and height issues aside (which will only really matter to Reacher purists anyway), Cruise is actually pretty good as Reacher, delivering a growlier-than-usual performance that essentially makes him seem like Mission Impossible's Ethan Hunt nursing a three-day hangover. There's also solid support from Pike, Jenkins and Oyelowo, though the film is basically stolen by Werner Herzog (‘I spent my first winter as a prisoner in Siberia wearing a dead man's coat, I chewed these fingers off before the frostbite could turn to gangrene’), despite the fact that he's only in a small handful of scenes. On the evidence here, McQuarrie has a knack for injecting moments of humour into violent fight sequences, whether it's Reacher calmly beating up five people or some over-enthusiastic henchmen knocking each other out while trying to attack Reacher in a bathroom. In addition, McQuarrie's script doesn't skimp on actual detective thrills (the dialogue is very similar to the books) and the scenes of Reacher figuring out the case are nicely done. The main problem with the film (apart from there not being enough Herzog) is that it occasionally overdoes the cheese factor and slips into unintentionally laughable territory, most notably during a ridiculously gratuitous shirt-off scene where Cruise's torso is distractingly shiny. Similarly, there's zero chemistry between Pike and Cruise, so it's probably just as well the film ducks out of giving them a love scene. It's never quite clear just how much of Jack Reacher is actually meant to be funny, but this is still an enjoyably cheesy action thriller and there's enough here to warrant the already greenlit sequel.